A tool for professionals, opt for our 50 Metre Fibreglass Measure Tape today. Available online at wholesale prices, this highly effective tool allows you to record the most accurate measurements. Whether you're a surveyor by trade or embarking on a new DIY project, it has a simplistic design you're sure to appreciate. 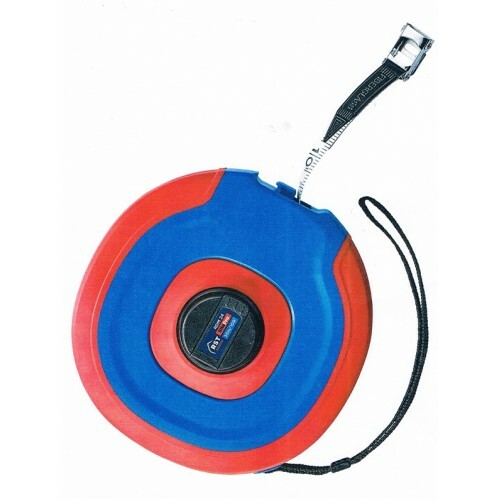 The compact, hand-held tool features a bright red and blue ABS plastic casing. Fitting easily into one hand, the highly visible finish allows it to be spotted easily in the largest of tool bags. In addition, the ABS casing makes it lightweight, hardwearing and easy to slip into pockets during more complex tasks. At the centre, a black handle allows you to lock the measure in place or release it to rewind the roll inside. A slim strap is also included in the design, meaning it can be hung from bags or wrapped around your wrist as you make a note of the measurements you have taken. Internally, we include a white flexible measuring tape with black line and numerical markers. Using this you'll be able to measure up to 50m in cm and 165ft in inches. The tape is 13mm in width to improve visibility and can be bent around corners, edges or objects for those more complex projects. At The Ruler Company, we pride ourselves in offering a wide range of quality measuring tools to every customer. If you have any questions about this measuring tape or any of the other lines in our collection, contact us today.